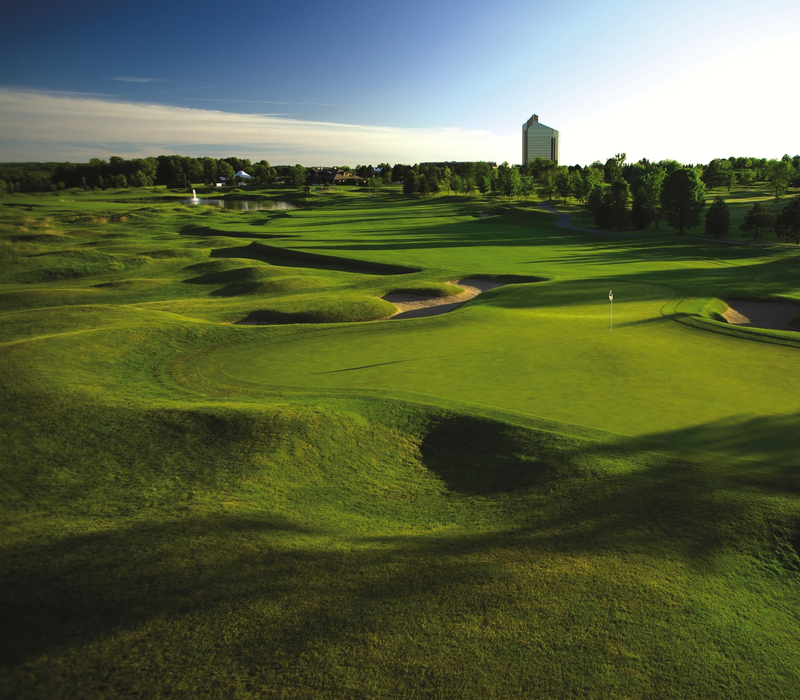 TRAVERSE CITY, Mich. – Golf course openings are rare in these tough economic times. Three decades ago that wasn’t the case, but none back then were as celebrated as Jack Nicklaus’ The Bear at Grand Traverse Resort. Grand Traverse, then just five years old, took an extraordinary step when The Bear was ready for play. Virtually very member of the media covering the 1985 U.S. Open at Oakland Hills was invited to play the layout the day after Andy North won his second Open title, and most of them showed up. That type of sendoff for a new golf course was unheard of, and media members from throughout the country found the layout appropriately named. It was indeed a bear. The Grand Traverse tower over looks the humps and bumps of The Bear. Over the years the course has been changed a bit, and Grand Traverse has undergone ownership changes. It remains, though, the heart of golf in the Traverse City area – and I consider that region the golf capitol of Michigan. Apparently I’m not alone. Golf Digest lists Traverse City as one of its Top 10 Best Buddies-Trip Golf Destinations this year. Traverse City has grown considerably since The Bear opened. Now the area has 17 championship courses. The Bear is just one of three at Grand Traverse. Spruce Run, which pre-dates the resort, opened in 1979 as a Bill Newcombe design. Gary Player’s first Michigan course, The Wolverine, opened in 1999. Now owned by the Grand Traverse Band of Ottawa and Chippewa Indians, Grand Traverse has a 17-story hotel that features most interesting upscale dining (The Aerie Restaurant and Lounge) on the 16th floor and two casinos are nearby. Also new this year is an expansion of the golf teaching staff. Director of instruction Scott Hebert, lead instructor Terry Crick and assistant Charlie Hathaway have been joined by two new lead instructors – Randy Ernst and Adam Roades. The Bear, still the toughest course in the area, was strangely bypassed as a site for pro tour events. A Senior PGA Tour event, the now defunct Ameritech Senior Open, was played there in 1990 before moving to Chicago for a 12-year run. The Michigan Open was played on The Bear for 28 years, and Hebert won it six times. That tourney may have left in 2008, but The Bear has maintained its high profile without hosting an annual big event. In 2012 the Michigan Golf Course Owners Assn. named The Bear and Grand Traverse its Course-of-the-Year. That’s one lofty honor, given that Michigan has more public courses (768) than any other state. And, only two other states have more total golf courses. Golf is indeed big business in Michigan. 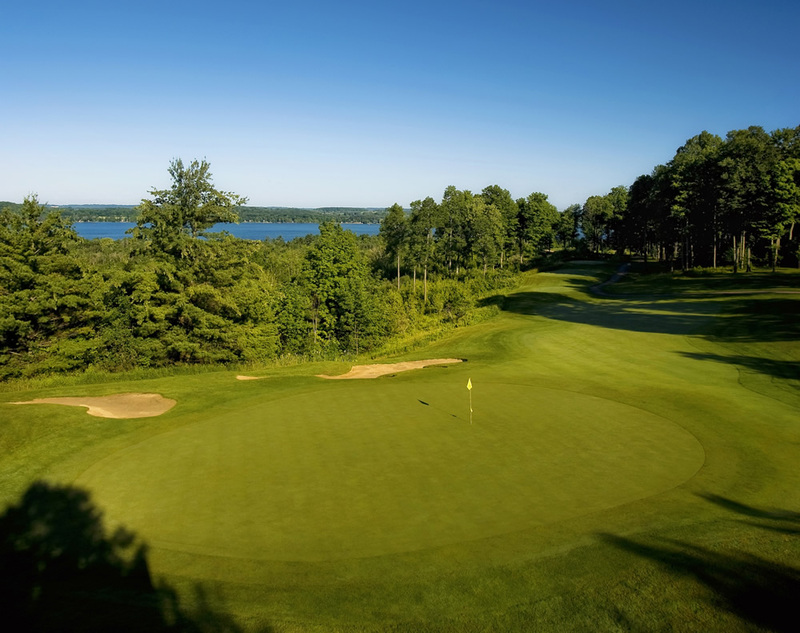 Traverse City golf, though, isn’t limited to The Bear and Grand Traverse. Shanty Creek, another long-time favorite in Bellaire, has four courses including two that have been widely recognized – Arnold Palmer’s The Legend (its popular par-3 fourth hole is shown above) and Tom Weiskopf’s Cedar River. The Bear and The Legend together started making Traverse City a significant golf destination. Now both United and American have direct flights from O’Hare to Cherry Capital Airport in part at least to accommodate golfers. Shanty is celebrating its 50th anniversary this year, and Cedar River has long been one of my all-time Michigan choices. Interesting things are going on at another Shanty layout, though. Eight-inch cups have been added on all 18 greens of the Summit course, a move to make the game easier and encourage more people to give this challenging sport a try. A new set of forward tees, set at between 95 and 125 yards, have also been added to the layout, designed as a par-71 by architect William Diddel that plays 6,260 yards from its tips. This innovative moves are – at the very least – a good try to freshen things up a bit. 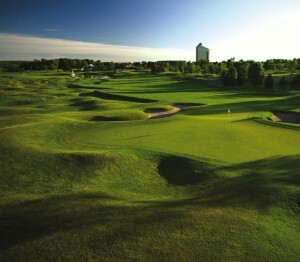 One of Traverse City’s other resorts, A-Ga-Ming, is also a multi-course facility. Located in Kewadin, it has three 18-holers. Best of Traverse City’s other seven courses may be LockenHeath (a Steve Smyers design in Williamsburg that is the longest of the region facilities at 7,239 yards) or Manitou Passage, in Cedar, which offers great views overlooking Lake Michigan. The views are so good, in fact, that ABC’s Good Morning America named its Sleeping Bear Dunes National Lakeshore as “America’s Most Beautiful Place.’’ It was selected after judging 10 contenders that included spots in California, Hawaii and North Carolina.